The best way to beat skin cancer is to know the warning signs and act fast if you see them. 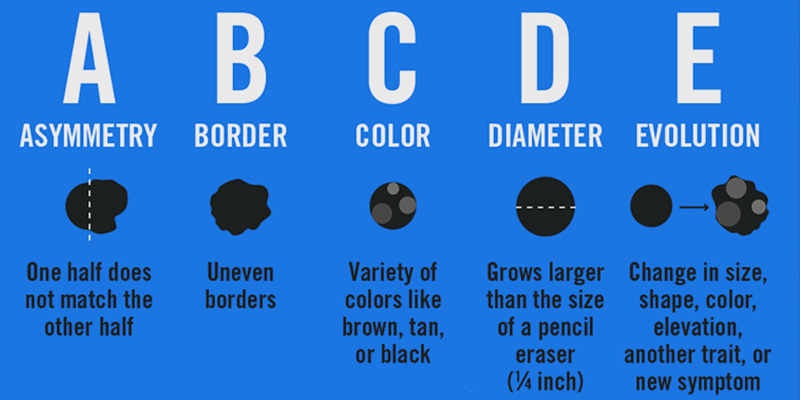 When performing your monthly at home skin exam, look for the ABCDEs of Melanoma. Contact a dermatologist right away if you notice one of these signs. Look for signs of asymmetry when performing an at home skin examination. Moles can be raised or flat against the skin. A normal mole should have two matching sides. Moles with two halves that differ from one another are consider asymmetrical. If you find an asymmetrical mole on your skin, contact a dermatologist for a dermatological skin examination. Moles with signs of an irregular border should be examined by a dermatologist. A healthy mole will typically have a consistent shape and clearly defined borders. If you see that a mole has unclear, hazy, or irregular borders, contact a dermatologist for an examination. Variations in mole color, including arbitrary shades of tan, brown, black, red, and blue, can be a sign of skin cancer. Most moles will have a pretty consistent shade. If you find a mole with inconsistencies in shade or color, contact a dermatologist for a medical evaluation. As a general rule of thumb, anything larger than the end of a pencil eraser (6 millimeters or 1/4 of an inch) should be examined by a dermatologist. Likewise, if you notice growth of a mole or lesion, consult a dermatologist for a professional opinion. Moles that evolve (grow or change in color or shape) should be examined by a dermatologist. In fact, Any changes in your skin should be carefully monitored and brought to the attention of your dermatologist or primary care physician. This includes growth or other significant changes in moles and recurring scabs or small pimple-like bumps that fail to heal after several (3-5) weeks. Have you found a sign of Melanoma? Do not wait. Contact SCARS Center to schedule a dermatological skin examination today.